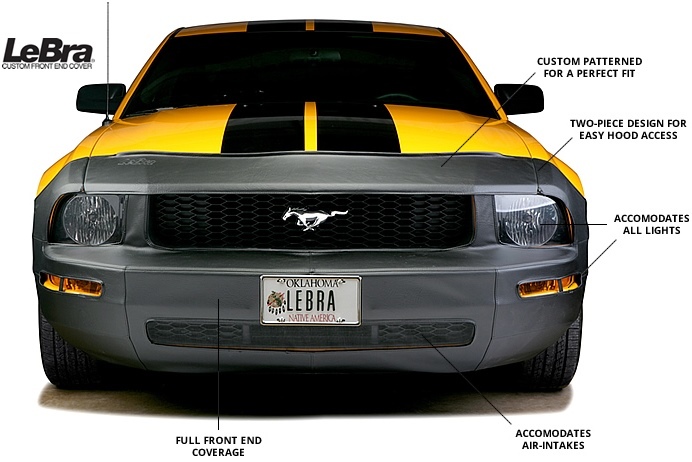 LeBra Custom Car Bras are the ultimate in style and full front end protection for all vehicles. Solid black in color, made of leather grain vinyl, allows for optional front plate if needed, and all original cut outs for factory fog lights, head lights etc. Mesh screen over grill area, allows hood to open, perfect custom fit full front end cover mask. * LeBra car bra images do not reflect your exact vehicle. LeBra Custom Front End Covers are the ultimate in style and full front end protection for todays vehicles. LeBra Warranty LeBra Front End Covers are warranted to be free from defects in material and workmanship for a period of 1 year from the date of purchase by the original retail purchaser. This warranty does not cover defects in your LeBra Front End Cover due to improper installation or normal wear. LeBra will, repair or replace any LeBra Front End Cover which it finds to be defective in material or workmanship at no charge and return it to you postage paid. LeBra Car Bras - Solid black vinyl custom car bras are the ultimate in style and full front end protection for vehicles. Protects vehicle paint from common road hazards, rock chips, bugs, and road tar. Covers all painted front end surfaces. LeBra Hood Masks - Protection from rock chips, insects and road debris. Sporty appearance with great fit. Quality weather resistant leather grain vinyl. Engine fully accessible. LeBra Hood Protectors - The stylish way to protect your vehicle's hood. Protects vehicle paint from common road hazards. Attractive midnight black leather grain vinyl. Glove like, aerodynamic look Molds to the contours of your vehicle's hood. * Note - newly painted vehicles please check with your body shop painter for cure times before using a LeBra car bra.